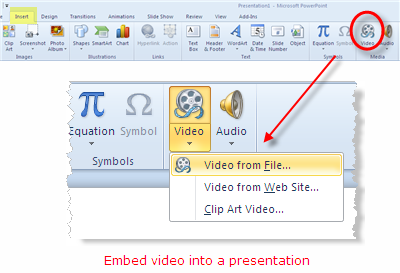 PowerPoint 2010 now enables users to embed videos to a presentation. To insert a video, please make sure that the slideshow is in ASF, AVI, MP4, MPG, MPEG, QT, SWF, and WMV format. 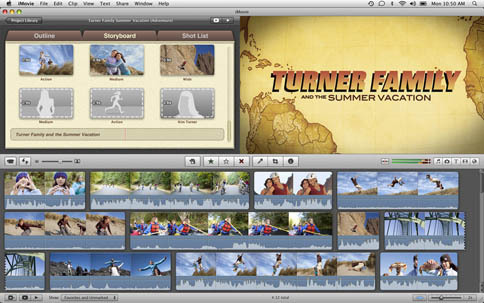 (To play QuickTime files, you need Apple QuickTime installed.) In this article, I will demonstrate how to create a slideshow and embed it into a PowerPoint presentation. 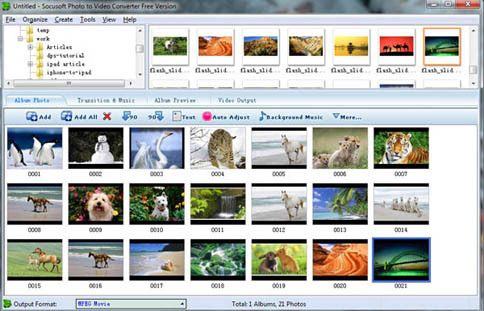 To create a slideshow, you can use DVD Photo Slideshow. 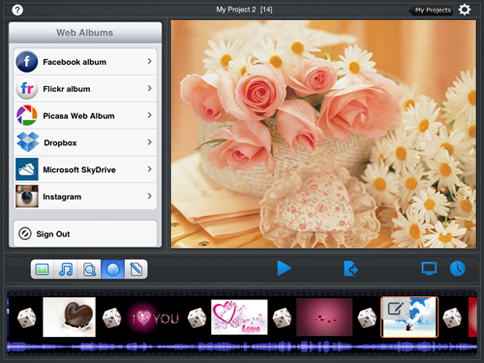 It enables you to create a slideshow from your images with music, transitions, pan&zoom effects, text and more effects. 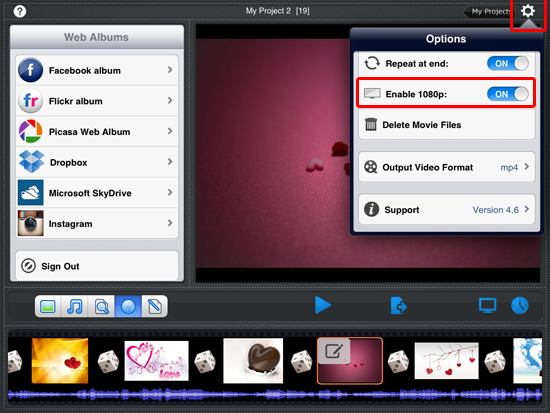 Then you can export a slideshow video of AVI, MPG, MP4 or SWF format compatible with PowerPoint. Before inserting a slideshow, you’d better create a new folder to put your PowerPoint and slideshow video. This can ensure PowerPoint will find the video when you copy or move the presentation to another computer or place. PowerPoint does not save the video, it only creates a link to the video’s current location. If you move or delete the video, PowerPoint will not find the video to play it. So you should put the PowerPoint and video in the same folder, and move them together. Click Insert from the PowerPoint menu bar, then Video->Video from File. After that, a window will pop up, asking you to place the video you want to insert. Locate the video and insert it into your presentation. At the same time , you can choose to automatically play the video or play it when clicked. 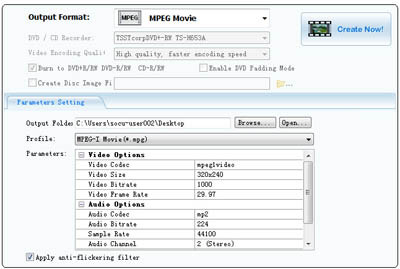 Click to choose the inserted video, under Playback menu, you can set the video height and width, tell the PowerPoint to play it in full screen, and do other settings. This entry was posted in DVD Photo Slideshow, Tips and tagged create a slideshow and insert into powerpoint presentation, create a slideshow for powerpoint, embed slideshow to powerpoint, insert a slideshow video into powerpoint 2010 on January 31, 2013 by Sarah Jablich. 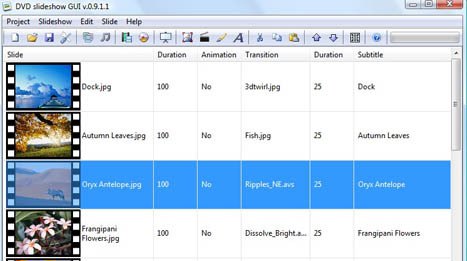 Are you searching for a program to produce a slideshow with high resolution? Photo Slideshow Director HD is a slideshow app which can produce maximum 1080p slideshows. 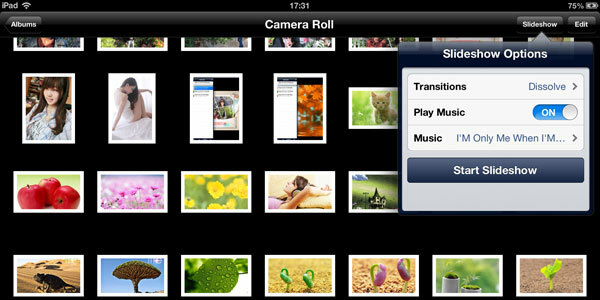 The slideshow app enables you to showcase your photos in HD videos with music, transitions, subtitles and other effects. 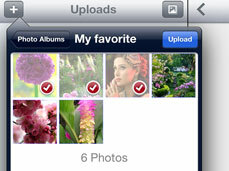 It can import photos from iPad and web albums, including Picasa, Flickr, Facebook, Dropbox, SkyDrive and Instagram. After adding photos, you can customize the slideshow with kinds of effects, such as various transitions, pan&zoom, slideshow and music synchronization, and etc. It supports 1080p image resolution for playing slideshows on HDTV. 1.To display your iPad photo slideshow on TV, you can connect iPad to TV using Apple TV, Apple Digital AV Adapter or Apple VGA Adapter. 2. Touch Setting icon on the right top of the app screen, then turn Enable 1080p on. 3. Touch Export icon and choose HDTV/Airplay. 4. Mirror 1080p HD slideshow on HDTV via Airplay or using cable. 1. Touch Export icon, you can see a list, showing options to share the slideshow. 2. Choose a way to save and share the slideshow, you can save it to iPad Photo Library, upload it to YouTube/Facebook/Dropbox/SkyDrive, even wireless transfer it to your PC. 3. To save the slideshow on iPad, touch Photo Library . In the pop-up window, enter slideshow title and description, choose HD-720P, then touch Publish Now! to save the 720p HD slideshow in your iPad. This entry was posted in Best ipad slideshow app and tagged 1080p photo slideshow maker, high resolution slideshow producer, make slideshow with high resolution, produce high resolution slideshow on January 29, 2013 by Sarah Jablich. Dropbox is a kind convenient service to help us backup, save and share our files on the Internet. Saving files on it, we can access our files whenever we sign in our Dropbox account without worrying about losing our files. Let’s learn how to transfer our photos and videos to Dropbox from iPad for backup or sharing. 1. Install Dropbox on your iPad from App Store. Then touch Dropbox icon to open it, enter your Dropbox login information to sign in. If you do not have a account, you can touch “Create Account” to register it. 2. After signing in, touch “Uploads” from the main taskbar at the left bottom of the screen. 3. Touch the “+” on the left top of the screen in “Uploads” area, you can see all your iPad albums are listed there. 4. 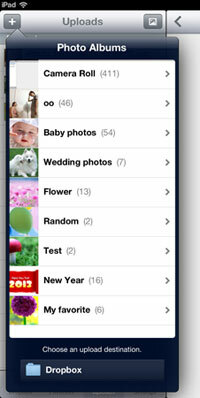 Choose a photo album and touch it to show all photos and videos in the choosed album. Then touch photos/videos to choose them. 5. 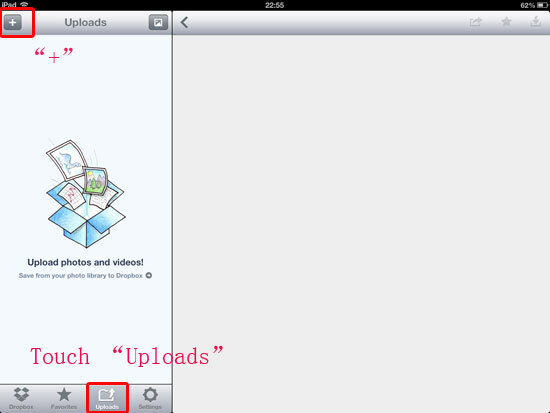 Touch “Upload” to upload choosed photos and videos to your Dropbox account. And the uploading process will be shown in “Uploads” area. Touch “Dropbox” from the task bar, you can see the photos and videos you have uploaded. This entry was posted in Tips and tagged move photos and videos to dropbox on ipad, transfer ipad photos/videos to dropbox, upload photos and videos to dropbox on ipad, upload photos/videos to dropbox from ipad on January 27, 2013 by Sarah Jablich. To show your product photographs to customers or your photographs to many people in a room, iPad’s screen seems too small. So you need to mirror iPad’s display on a large monitor to share your pictures to others. Showing photographs in slideshow may more easily attract people’s attention and interest. 1. Turn your photographs into a dynamic slideshow with music and transitions. To create a slideshow, iPad itself has this feature. Open an photo album on iPad, touch “Slideshow“. In the Slideshow Options window, choose transitions, turn Play Music on, and choose a song from music library, then touch “Start Slideshow” to show photographs with music and transitions. However, with iPad’s built-in slideshow feature, you can only make a very simple slideshow with limited transitions and one song. Also, you can not save the slideshow. To create a more attractive photograph slideshow, you can use Photo Slideshow Director HD. 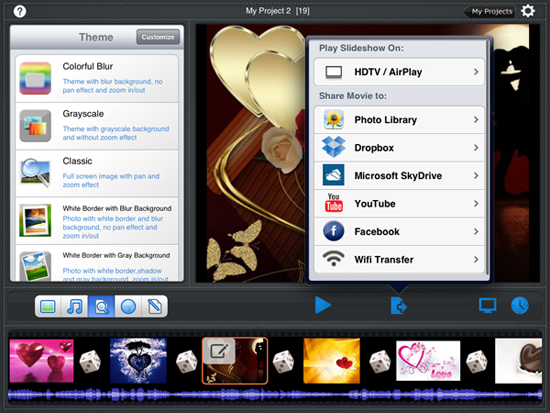 With it, you can create a perfect slideshow with music, transitions, theme, pan&zoom, captions and more effects. Besides, you can save the slideshow on your iPad photo library as a video. You can use two methods to stream iPad display on large monitors: Method 1. Use Apple Digital AV Adapter Method 2. Take advantage of iPad’s Airplay. Method 1. Connect iPad to large monitor using Apple Digital AV Adapter and HDMI cable. It can transfer both audio and video to large monitor. Connect the Apple Digital AV Adapter to your iPad via the 30-pin dock connector and to your HDMI-compatible display using an HDMI cable. Then your iPad’s display will mirror exactly on the external monitor. Now you can find the photograph slideshow and play it on your iPad, at the time, your photographs will be mirrored on the large monitor. If you want to mirror iPad display on VGA-compatible screen, you need to use the $29 Apple VGA Adapter. Method 2. Airplay. To use Airplay, an Apple TV is needed to be connected to a large screen. Make sure iPad and Apple TV are using the same WiFi network. Double-press your iPad home button. Swipe the app-switching tray from left to right till you see a volume slider and the AirPlay icon. 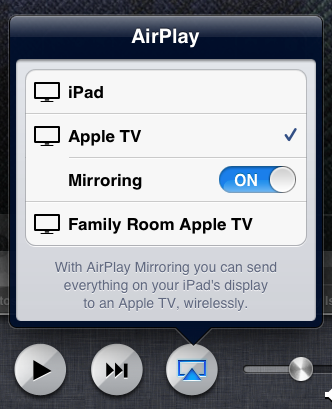 Touch Airplay icon and check “Apple TV” and toggle the Mirroring switch to On. Now you can view your iPad photographs on the large screen. Note: To use Airplay, Apple TV and iPad should both run iOS5 or latter. That means it does not work on iPad1 and Apple TV1. This entry was posted in Best ipad slideshow app, Tips and tagged mirror ipad photos on tv, mirror ipad to large monitor, stream ipad to projector and tv, view ipad display on large monitor, watch ipad photographs on large screen on January 26, 2013 by Sarah Jablich. 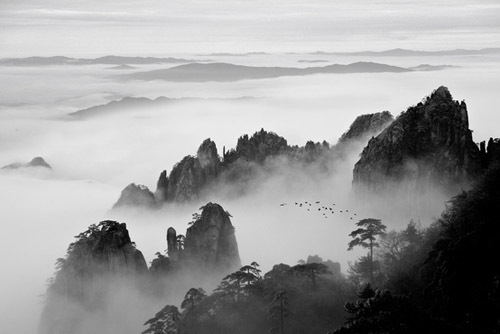 Now more and more photographers like using slideshows to present their photographic images. And there are number of slideshow software which enables us to apply transitions, add text and subtitles, animations and more effects. 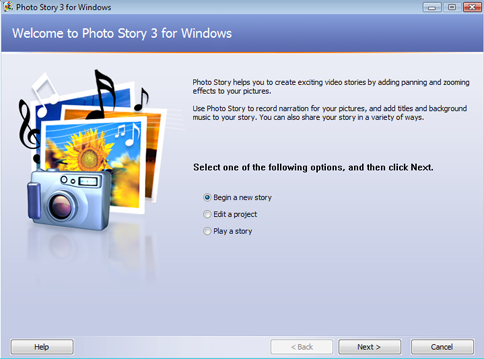 So it is not difficult to create a photographic slideshow. However, to create a successful and professional photography slideshow, these tips may give you some hints. 1. You need to find a professional tool. Find a satisfying one from so many slideshow makers is not easy. I create slideshows in different ways. On my iPad, I like using Photo Slideshow Director HD. Personally, I think this is the best slideshow app I have used. It not only has kinds of slideshow effects, such as 2D or 3D transitions, pan&zoom effects, music, also it enables me to use photos from web albums, including Facebook, Flickr, Picasa, Dropbox, SkyDrive and Instagram. Moreover, I can directly upload slideshows to Facebook, YouTube and Dropbox for sharing. Also it has a Mac version—-HD Slideshow Maker. I like creating slideshows on my Windows PC too. And DVD Photo Slideshow is my first choice. It is easy to use and professional. Also I can use it to burn a slideshow DVD and watch my photographic images on TV. 2. Choose quality photographs. To make your slideshow succeed, attractive photographs with high quality is the key factor. Make sure photos are not too bright or dark. 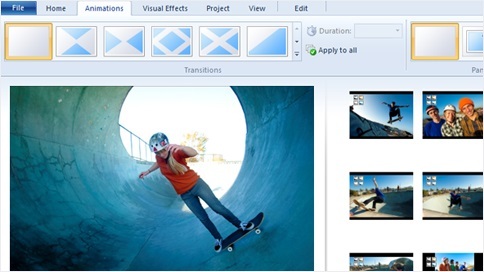 The slideshow makers I refer to all have built-in photo editor to help you optimize photos. Also, please use a variety of photographs. So your audiences will not feel boring. For example, You can include people, Christmas trees, gifts, snow in a Christmas Photographs Slideshow. 3. Pay attention to music. Choose music that match your photographs, such as love songs for wedding and Valentines slideshows. If you want to share the slideshow to YouTube and Facebook, you should find some royalty-free music to use, because YouTube and Facebook may block your slideshows with copyrighted music in some countries, even reject your slideshow. 4. Control your photography slideshow time. A long slideshow may risk losing viewers’ patience and attention. But a too short slideshow is hard to touch people. A best length should be 4-5 minutes. So you’d better control the number of photographs and time of each slide and transition. 5. Add some captions or texts. You may need to add some text on photos to deliver the special meaning of the photographs. Please keep the text short and precise. For example, a wedding slideshow without any text is really a failure. On the contrary, people may be moved to tears with your simple texts. This entry was posted in Tips and tagged create a photography slideshow, photography slideshow maker, photography slideshow tips, tips for photographic slideshow on January 25, 2013 by Sarah Jablich. It is available to use a YouTube video in your blog or website. YouTube provides a code which you can copy and paste to your website or blog for embedding. 1. Go to YouTube website and find a video you want to use. To use your own video, you need to sign in and find your videos in Video Manager area. 2. Below the video, click “Share” and choose “Embed” for the available sharing bar. 3. Copy the code. Also you can set some parameters, such as video size. You can choose to use HTTPS code or old embed code. If you do not like others seeing recommended videos , please uncheck “Show suggested videos when the video finishes“. 4. Paste the code to your website in Dreamweaver. Open the web page in Dreamweaver, then paste YouTube code to the place where you want to embed the video. Upload changes to your website server, you can see the YouTube video appearing in your website page. 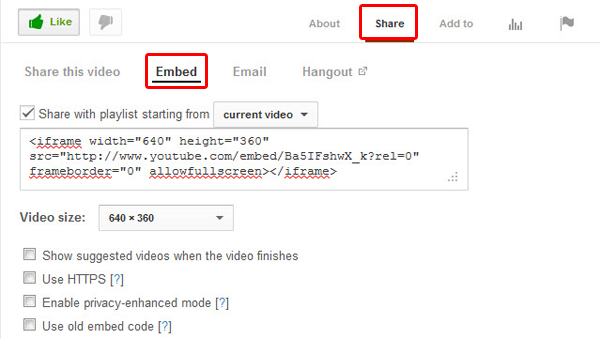 To embed a YouTube video to your blog, just paste the code in HTML interface, then Publish or Update the post. If you want to change the video size, please set the “width” and “height” parameters in the code you just pasted. This entry was posted in Tips and tagged add youtube videos to blog, embed youtube videos to website, insert youtube video in my blog and website on January 24, 2013 by Sarah Jablich.